For most homeschooling moms I know, the subject of Fine Arts is met with a quick, “I can’t…” and “What curriculum should I buy?” or “Will the local coop offer art?” Anymore, I sigh and walk away. Usually these moms don’t want to even explore fine arts. They want a quick fix on the subject so they can get in a semester and be done with it. It makes me sad to know what these families are missing. What exactly constitutes Fine Arts? “Historically, the five main fine arts were painting, sculpture, architecture, music and poetry, with minor arts including theater and dance. Today, the fine arts commonly include additional forms, including film, photography, conceptual art, and printmaking. “ ~Wikipedia. Later in the page music, drawing, mosaics, digital imaging, quilting and calligraphy are all mentioned as well. ﻿Don’t think it has to be “fine” in your eyes for there to be an appreciation. Some people’s art is with a pencil… Some with music… Some with poems… Art is so much easier than what people make it out to be. Listening, Looking, Inspecting… Don’t think just because you and/or your children “can’t” draw, they can’t “do” art! There are several people out here who make MONEY out of “junk yard art” and painted rocks. Art is Expression. Children love to express themselves. All you have to do is provide the tools and you never know where their imaginations will lead. Here are some practical ideas to make Fine Arts “get-at-able”. Drawing = Do your children draw stick figures or “people who look like potatoes”? Build a tin man out of cans. Build houses out of milk cartons. We don’t have many museums out here in the boonies. The driving distance, time commitment and cost make visiting one a rare treat. Play a piece of classical music and have the children explain how it made them feel.﻿ Classic Tunes & Tales﻿ is a great resource I highly recommend adding to your home library. We also really enjoy﻿ The Composers’ DVD Set. Show your children a picture and have them explain to you what they see. 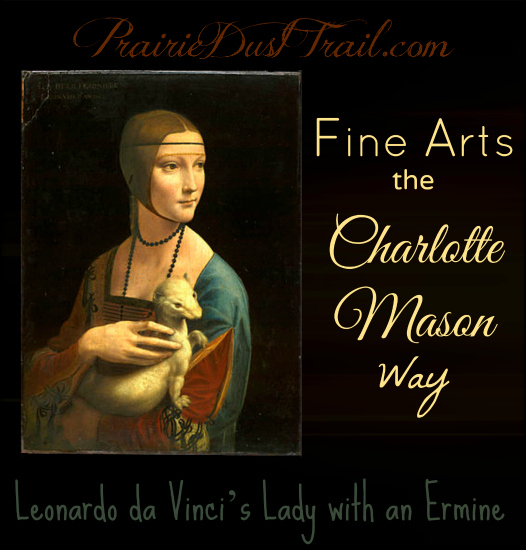 Dollie Freeman just posted an article on her blog about﻿ How to Teach Picture Study the Charlotte Mason Way. ﻿Again the Divine Entertainment﻿ The Artists’ DVD’﻿s are a lot of fun to watch and learn from. It’s a lot of fun to fit fine arts in with History. Pick at time period or a particular battle or important event. Pick a painting and a piece of music from that time. A poem or a speech… Practical application… and making it fun. The point is to fit as many different subjects into the same activity as possible and they will catch more and be able to apply more of it. Unit Studies are Charlotte Mason APPLIED.﻿ Beth Starr from Starr Weavings Blog ﻿says, “This is where a timeline is a great resource. Even if you study an artist or composer out of order they can find in history where that person fits in the timeline of history.” We have used a KONOS time line I bought around 1995 so I asked Beth which she used with her family and she suggested the Knowledge Quest Time Builder for iPad. We don’t have an iPad in our home so another friend, ﻿Dollie Freeman﻿, suggested﻿ Homeschooling in the Woods.